Latest news (2018) - spare parts. Manufactured by V.E.B. 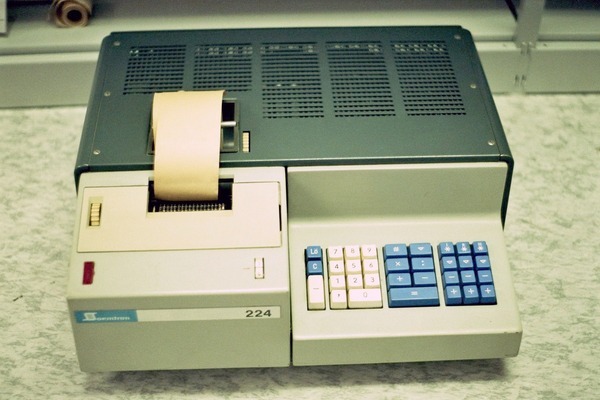 Büromaschinenwerk Sömmerda, the Soemtron branded range of ETR22x calculators encompassed three variants, the ETR220, ETR222 and ETR224 (a model with printout capabilities). 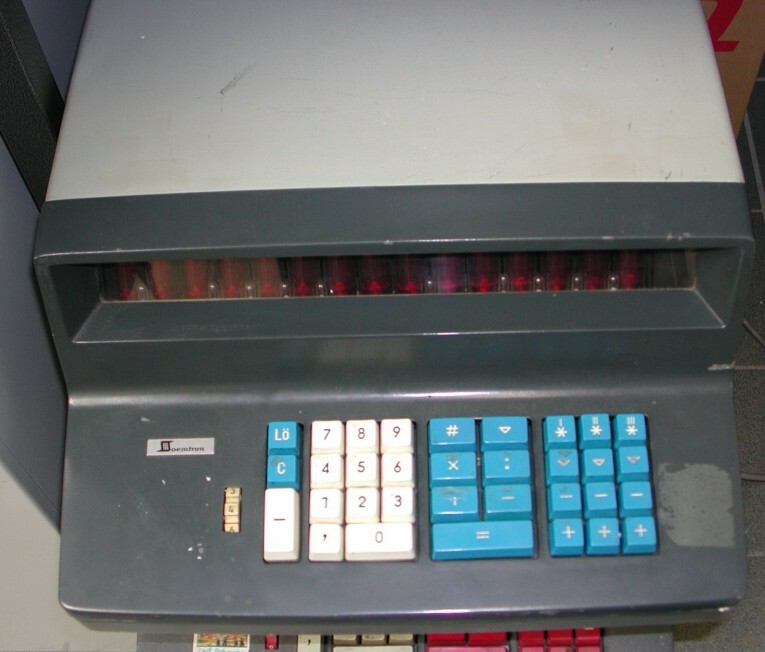 A possible fourth calculator, the 221, was seen in various sales literature of the period and does show and describe the type 221 printing calculator, but it is believed now to have only existed as a single machine for a publicity release (December 2009) in the Büromaschinen Lexikon, a German publication of the 1960s. 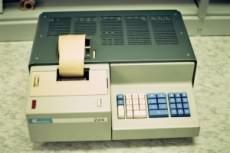 That one machine was possibly the one delivered to Office and Electronic Machines (OEM) in London, the UK importers. 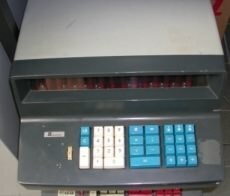 Welcome to the only complete collection of Soemtron model ETR22x calculators, a collection which came into being after an old piece of equipment was received from Prague in the Czech Republic, following a Google search for "core memory" one day during some research into the PDP-7 range of computers manufactured by the now defunct Digital Equipment Corporation. The unit duly arrived, but it was found to be in a very poor state, dirty, rusty and missing its power supply and covers (photos). After a few days more research and translating some German text off of the baseplate, we worked out what this old dirty corroded hulk was - a Soemtron ETR220 calculator, which turns out to be a very interesting piece of early electronic calculator history from 1960's and 70's German Democratic Republic. Over time we have conserved our original Soemtron ETR220 and eventually we hope to get first piece of Eastern Bloc calculator history from the 1960's into full working order, once we can get a suitable power supply into her. Bookmark this page and come back from time to time and see how we are getting on. We have now published and are updating full circuit diagrams (ein schaltplan) of the machine and its inner workings for those of you who are interested - not many probably! but there again this is the Internet, so we hope you drop by again soon. 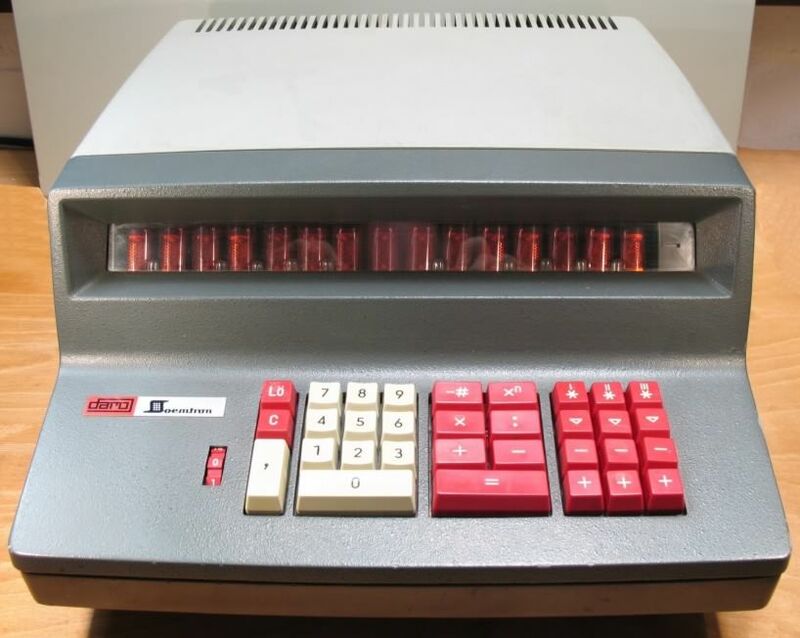 The two topmost pictures above are of a very good condition Soemtron ETR220 and an ETR222 owned by calculator collector Serge Devidts, for more information see his website. The bottom picture is of an ETR224 printing calculator, a very rare machine as only 526 units were built, whilst there were over 150,000 ETR220s. Similarly the ETR22 of which only 3,203 were built, is also a very rare item. Older news from Soemtron (2016-2008). January 2018 - 3D printed cabinet latches and other spare parts. Plastic parts for the Soemtron ETR range of calculators are now around 50 years old and have reached their end of life and have become extremely brittle, none more so than the cabinet latches that hold the two-part covers to the main chassis. These seem to be the first items to break. Plastic mouldings in the ETRs were sparingly used (EG. Decimal point and mains switches) and do seem to have been quite well made in most instances, but 50 years on since their manufacture they have become prone to sudden disintegration. Some items, like the keyboard guide plate suffer from stress fractures whilst not actually falling apart. 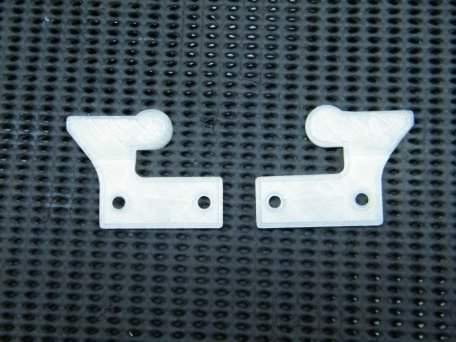 So, starting with the cabinet latches of which we have had multiple failures, we have designed replacements and had them 3D printed. These are direct replacements for the original parts (05-220-3023-7, 05-220-3024-5) in the ETR220 and 222 units and require no modifications to fit, simply swap out the broken part with these new parts. We have stock to hand so for price and delivery contact contact us, or email us . Brand new unused Z570M display nixie tubes. New equivalent for the power supply mains input filter which often "leaks" its contents and then destroys itself. Contact us, or email us for prices and shipping. Previous events in the Soemtron website timeline. The Soemtron ETR220 range also appeared in the "Büromaschinen Lexikon", a German publication covering office machinery and products. Soemtron branded products appeared in the 1962/63 to 1968/69 issues, but only three are available online. See item 4 in the links section below.